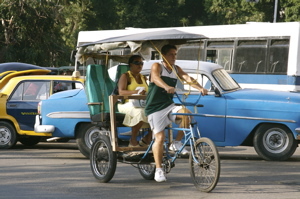 My first day in Cuba was spent strolling and taxi-ing around Havana, taking in the sites. Firstly to El Capitolio – a grandiose building – and my first encounter which resulted in me parting with some pesos. It’s pretty obvious, I was just a bit slow at the time having only flown in the day before. But when some lady showed me into this off-limits room, which in fact was not that amazing (but it did include the original phone from 1929 – wow! ), it was only moments later that the word ‘tips’ echoed round the chandeliered and mirrored room. Next stop, el museo de la Revolucion for some history (and spanish practice). Then I tried to buy a bus ticket for the following day – now that was fun! No, you can’t buy one from the infotur place (LP wrong again), but have to go to the Viazul terminal. Challenge of the day – how to get there? I started walking, hoping to be accosted by a taxi/bici-taxi but to no avail – amazingly. Eventually, I did get a bici-taxi, but we clearly weren’t speaking the same language. I soon ended up on the Malecon – definitely not near the terminal. Here I did find a taxi-driver (some guy who owned a car at least) who did speak my language. Great. Now I know I was ripped off, but at least he got me to the right place, waited for me to buy a ticket and then took me to the plaza de la Revolucion. This is the square where huge rallies were held during the 60’s and on special occasions even now is used for public speeches by Castro. The tall landmark rising up from the plaza to the sky is the Jose Marti Memorial. By now I was feeling a tad peckish so got some moneda nacional and bought some snacks (I think I have a few too many cuban pesos for the trip though). 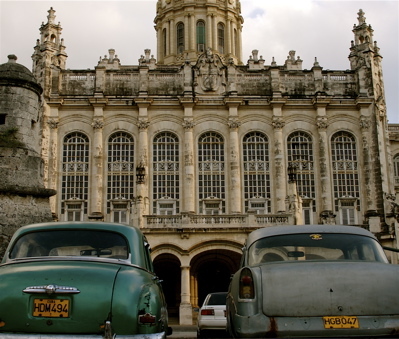 After some R&R back at the Casa waiting for the midday heat to fade, I headed back out to Habana Vieja. After a little stroll I happened upon Plaza Vieja and more importantly, a bar – the only bar with a brewery in Havana. Great beer, decent music and kebabs for dinner. Back for a early night, where I met a Canadian couple at the Casa. Next Next post: Bus, Sweat and…Shrimp?